Colleran Auctioneers is offering for sale by auction a bright, spacious, and secure first-floor three bedroom apartment at 10B Laurel Park, Newcastle. In good condition throughout, it is ready for immediate occupancy. This property will be of equal interest to investors, first time buyers or parents looking to accommodate their children while attending college in Galway as Laurel Park is less than a 10 minutes walk from NUIG. A deceptive apartment/maisonette from the outside, it is surprisingly spacious, and accommodation includes entrance hall through private front door, sitting room with open fireplace that complements the electric storage heaters, new fitted kitchen/dining room, and three double bedrooms and a tiled bathroom. Unusual for an apartment, it comes with its own back garden and block-built shed. 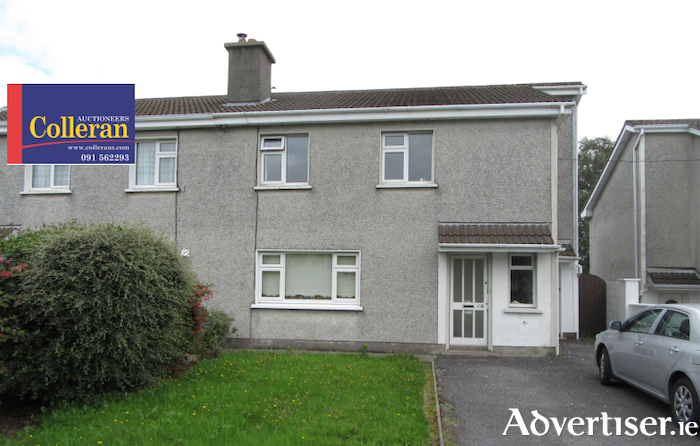 Located adjacent to UCHG and NUIG it is an excellent investment . For sale by auction on October 18 at an AMV of €160,000. Also included in Colleran's auction on October 18 is 129 Castlelawn Heights AMV €225,000 with open viewing Saturday 11am to 11.30pm; 23 Upper Fairhill, Claddagh AMV €340,000 with open viewing Saturday 1pm to 1.30pm, and 14 Whitestrand Road AMV €500,000 with open viewing 2pm to 2.30pm.